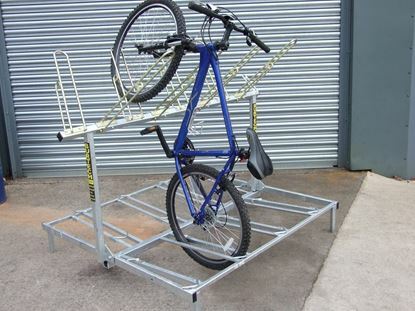 Bike storage rack available with or without castors. 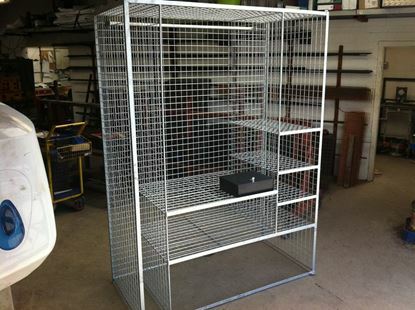 Mesh drying cabinet available with or without doors. 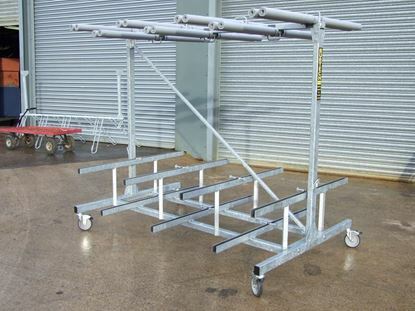 Movable drying rail on castors. The C2 Sideloader is designed to carry and store up to 2 open canoes or Sit on Top kayaks. Arm height is kept very low making loading simple from the side. The telescopic lighting beam can be set to the length of the canoe. The C2 Sideloader is a practical alternative to carrying canoes on a roof rack, where loading height can be a problem, as is the potential to damage your vehicle while loading. Many users of the C2 Sideloader have found that it is a convenient way to store their canoes at home, leaving them available for immediate use. 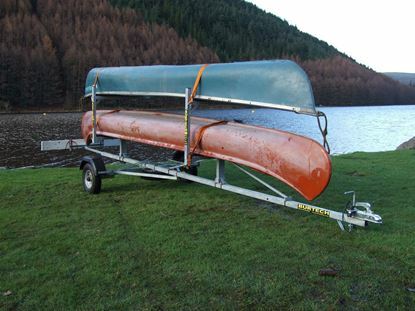 The C6 Canoe / Kayak Trailer is designed for smaller groups or the family with a lot of outdoor pursuits equipment. It can be supplied as a three level trailer to carry 6 open canoes, or as a two level (spaced further apart) to carry up to 12 kayaks, depending on size of boat. The C6 can be ordered with the horizontal distance between the support arms at either 1.7 or 2 metre to suit the length of your boats. All models are fitted with a telescoping rear light beam and concealed cabling. A storage box, steel mesh cage or steel mesh shallow pan can be fitted to this trailer. The storage box / cage takes up one arm of the trailer, up to two shallow pans can be mounted under the lower level of arms. When the support arms are specified at 2 metres, a Fiamma 3 bike rack can be fitted to the trailer on one or both sides. 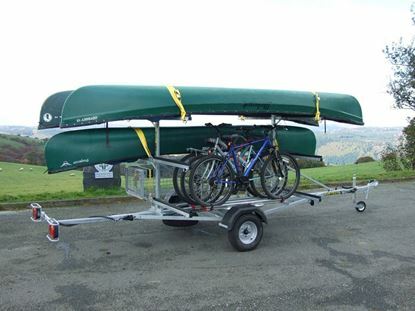 The C6 Canoe / Kayak Trailer is available without brakes or fitted with the optional over-run braking system which also has the advantage of providing a parking brake for when the trailer is disconnected from the towing vehicle; the un-braked trailer will need to be chocked.